Hire “Sarge” to motivate your troops! Kellman Beat Cancer Boot Camp is a licensed fitness based program for cancer patients, cancer survivors and those who love them. The Program was developed to help people diagnosed with cancer stay healthy in mind and body. Kellman Beat Cancer Boot Camp empowers all ages and stages of cancer survivors to take control of their physical and mental stamina, so they are better prepared to win the war against cancer. 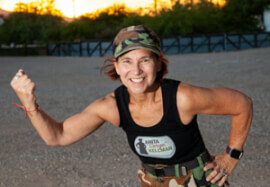 Kellman Beat Cancer Boot Camp is nationally recognized as the first physical fitness support group for cancer survivors. This licensed program has been highlighted on the NBC hit show The Biggest Loser as well as PBS and AARP. The odds of beating cancer are greater when someone is physically and mentally strong. The American Cancer Society says “newer research has shown that exercise is not only safe and possible during cancer treatment, but it can improve how well you function physically and your quality of life.” “Some people can safely begin or maintain their own exercise program, but many will have better results with the help of an exercise specialist”. So grab your sneakers and join us for a class in your area. Kellman Beat Cancer Boot Camp provides a supportive environment for those wishing to stay active during cancer treatment and beyond. Dealing with cancer is a physical & mental challenge. Kellman Beat Cancer Boot Camp can help you build strength & stamina to overcome the obstacles ahead. Regular exercise can give you the mental edge & self-esteem you’ll need to change your health. Reconnect your mind & body through fitness. Together we celebrate our accomplishments, share stories & set goals. Lifelong connections are made.